Into a 12 -14 inch non-stick saute pan, add the olive oil, cut red peppers, crushed red pepper flakes, black pepper, and the sea salt. Cook on medium low heat for 10 minutes stirring occasionally. Add the diced onion to the saute pan. Stir to incorporate the onion with the peppers. Add the minced garlic to the beaten eggs and whisk until blended. Add the eggs to the saute pan spreading them out evenly. Turn the heat up to medium high. Without stirring, cook the eggs until the edges begin to set. After the edges of the egg mixture have set, place the saute pan in the oven and bake for 15 minutes until the eggs are cooked. The top of the egg mixture should be firm to the touch. Another name for this dish is “inside out ravioli”. You can substitute bow tie pasta for the fettucine. 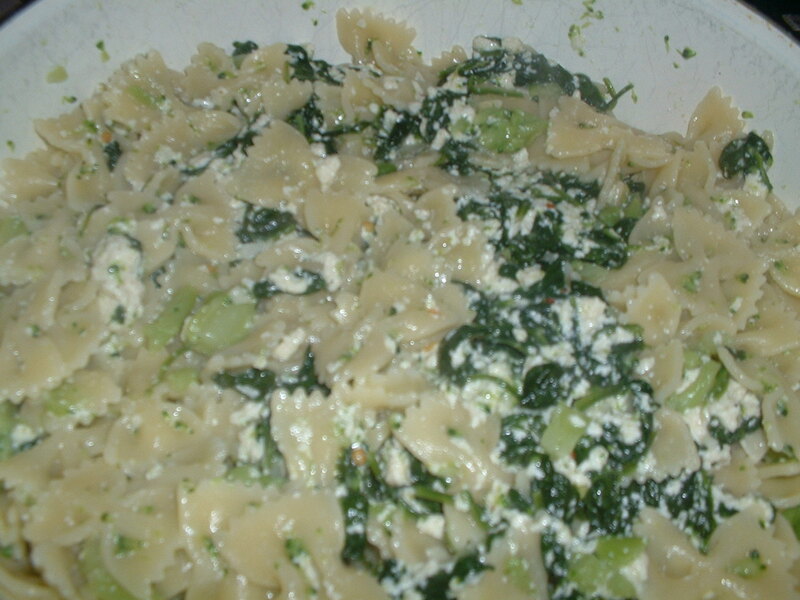 Add chopped broccoli to the pasta pot during the last five minutes of cooking time for added flavor and substance. Cook the fettucine pasta according to the package instructions in a pot of salted water. Before draining, reserve 1/2 cup of the cooking water. 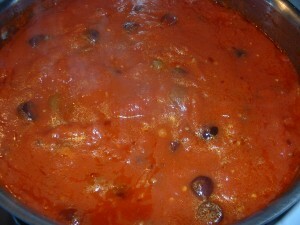 Into a large sauce pan, add the olive oil, the sea salt, garlic, ground black pepper, and the crushed red pepper flakes. Cook on medium heat for one minute. Add the spinach 6 ounces at a time and cook on medium heat until all of the spinach has wilted down. Add the basil, ricotta cheese, nutmeg and the Romano cheese. Stir to incorporate all of the ingredients. Turn the heat down to low and simmer this spinach and cheese mixture for 8-10 minutes stirring occasionally until the cheese thickens slightly. 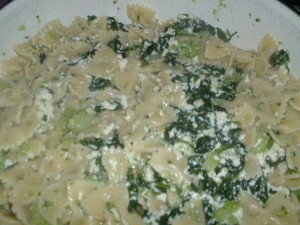 Add the fettucine and the reserved pasta water to the spinach and cheese mixture. Cook for 3 minutes on medium heat stirring frequently until the pasta gets coated with the sauce. Taste and add more black pepper, red pepper, sea salt, and/or Romano cheese if desired. This spicy, rich tomato sauce can be made in 40 minutes. Into a sauce pan, add the olive oil, crushed red papper flakes, anchovy paste, and the sea salt. Cook on medium high heat for one minute stirring frequently. Add the onions and garlic. Cook for an additional minute stirring frequently. Add the olives and capers. Cook for one minute stirring frequently. Add the tomato paste. Cook for one minute stirring frequently. Add the crushed tomatoes and can juice. Stir to incorporate all of the ingredients. Lower the heat to low and simmer with the lid on the pan about 3/4 of the way for 40 minutes. After 40 minutes, taste and add more sea salt and/or crushed red pepper flakes if desired. Add the chopped parsley and stir to incorporate. Serve over your favorite pasta or as a dipping sauce for fried mozzarella sticks, seafood, or eggplant. Into a large mixing bowl, add the cut potatoes and the olive oil. Mix thoroughly to coat each potato wedge with the olive oil. Add the paprika, red cayenne pepper, and the sea salt. Mix to coat all of the potato wedges with the dried spices. Spray a baking sheet with cooking spray. Spread the potaotes out evenly on the baking sheet in a single layer. Bake the potatoes for 1 and 1/2 hours or until they are golden brown. Add all of the ingredients into a large mixing bowl. Using your hands, mix until well blended. Form the turkey meat mixture into 1/4 pound patties. Refrigerate the burgers for at least one hour. Cook the burgers on a hot gas or charcoal grill for 6-7 minutes on each side turning only once. The burgers are cooked when the centers of the patties are firm to the touch. Serve on kaiser rolls with your favorite condiments. Into A Dutch oven, add the canola oil and the ground beef. Cook on medium heat stirring frequently until the meat is browned. When the meat is browned, push the ground beef to the side of the pot. Add the onions, jalapeno pepper, and garlic. Cook for three minutes. Stir the vegetables and the meat together to combine all of these ingredients. Add the chili powder, cayenne pepper, paprika, oregano, cinnamon, cumin, and sea salt to the Dutch oven. Stir well to combine the dried spices with the meat mixture. Cook for one minute. Add the tomato paste. Stir to incorporate the tomato paste with the ground beef and the vegetables. Cook for an additional minute. Add the chicken stock and the black beans. Stir to incorporate all of the ingedients in the pot. Cover halfway and simmer for thirty minutes stirring occasionally. Taste and add more sea salt and/or cayenne pepper if desired. Serve with grated cheddar cheese and/or sour cream. Into a mixing bowl, add the red onions, scallions, garlic, cilantro, the lime juice, chile powder, cumin, oregano, cayenne pepper, sea salt and the canola oil. Whisk until well blended. Add the fish filets and the shrimp to the mixing bowl. Toss to coat the fish and the shrimp with the marinade. Add the fish, shrimp, and the marinade to the food storage bags. Refrigerate the fish and the shrimp for one hour. Pat the fish and the shrimp with a paper towel to remove any excess marinade. Place the shrimp on skewers. Grill the fish and the shrimp on a hot gas or charcoal grill for about seven minutes on each side turning only one time. When cooked, the fish should be white in color and firm to the touch. The shrimp should be pink in color. Cut the fish into strips. Remove the shrimp from the skewers. Serve in tortillas with your favorite condiments such as guacamole and/or tomato salsa. Into a large plastic storage bag, add the garlic, the juice of the lemon, the olive oil, the thyme, the parsley, the sea salt, and the pepper. Place the chicken breasts in the bag and shake the bag to coat the chicken breasts with the lemon, olive oil, and the herb mixture. Marinate in the refrigerator for 30 minutes. Place the chicken breasts on a hot gas or charcoal grill. Cook for 8-10 minutes on each side or until no longer pink in the middle turning only once. Let the chicken sit covered loosely with aluminum foil for 10 minutes before carving. Using a fork, pierce the lamb chops in several places on each chop. Place the lamb chops in a large mixing bowl. Sprinkle the lamb chops on both sides with the garlic powder. Whisk together the mustard and olive oil in a seperate bowl until smooth and well blended. Pour the mustard and olive oil mixture over the lamb chops in the large mixing bowl. Using your hands, rub the mustard and olive oil mixture all over the meat. Refrigerate the lamb chops for two hours. Let the meat sit out at room temperature at least thirty minutes before cooking on the grill. Place the lamb chops on a hot charcoal or gas grill. Cook for 8-10 minutes on each side turning the lamb chops only once. Cook until an internal temperature of 135 degrees is attained. Let the chops sit for at least 10 minutes covered loosely with aluminum foil before serving. Into a Dutch oven, add the olive oil and the chorizo sausage. Cook the sausage on low heat for five minutes. Remove the sausage onto a paper towel to drain. After the sausage has cooled, dice it into 1/4 inch cubes. Add the tomato, roasted red bell pepper, garlic, onion, paprika, oregano, crushed red pepper flakes, sea salt, and the parsley to the hot olive oil. Turn the heat up to medium high. Cook while stirring frequently for 10 minutes. Add the rice. Mix well so that the rice gets coated with the olive oil, vegetables, and the spices. Add the chicken stock. Stir once to incorporate all of the ingredients. Bring the mixture to a boil and cover. Place the covered pot into the pre-heated oven. Cook for 40 minutes until the rice is cooked through. Garnish with the crispy chorizo sausage and serve.